When we did my blog redesign and worked on making the categories more user friendly, I realized my side dish and vegetable categories were very small. I have lots and lots of desserts and main dishes because those are more fun to post on, but we do eat other things. I realized that I need to post more on some of the other things that we eat. So, I am going to try to start posting more vegetable and side dishes. Any guesses what today’s recipe is? Yes, a side dish! I have been making this recipe for years. The original one came from Taste of Home, but I have varied it some over the years. 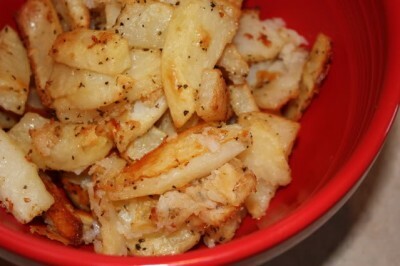 This is an easy side dish that is a little different than your normal potato side dish. What I like about it is that I usually have all these ingredients in my kitchen. There is nothing fancy or odd in this recipe. These potatoes work well with hamburgers, steak, chicken, and even pork. They go great with just about any type of meat. Cut each potato lengthwise in half. Cut each half into wedges. In a large bowl, sprinkle potatoes with oil; toss to coat. Combine the remaining ingredients. Add to potatoes; toss to coat. Arrange potatoes in a single layer on a 15-in. x 10-in. x 1-in. baking pan. Sprinkle with any remaining coating. Bake at 350° for 45-55 minutes or until golden brown and tender. First of all… WOW!! I love your new blog design. It really looks awesome and I must confess…. I am so jealous!! I really want a new look. I am sure you are pleased with it, or at least you should!! Now about those potato wedges- yum! Just wanted to let you know that I appreciate all the hard work that goes into this blog! I love to cook for my family of 3 girls & 3 boys & hubby. I have made many of your recipes. We have enjoyed them! For your info, the previous design was a little easier to find recipes, I think. The new design will not stop me from reading & trying your recipes. Just thought I should pass this along. Thanks for all you do. This recipe sounds so easy and yummy!! Thanks for sharing. Have a great day!! those look soooooo good!! 🙂 love your look, too!! Sounds wonderful. I’ve made potatoes with Lipton Onion soup mix but never like this. Definetly have to try it. I make these potatoes a lot, but I never thought of using Parmesan cheese. Yum! What a AWESOME!!! recipe for potatoes. I love potatoes, this looks delicious! Just curious – I keep seeing “seasoned salt” in recipes and I don’t know what it is. 🙂 I use regular salt in its place, but maybe that isn’t right? Please help! seasoned salt it also called seasoning salt. It is just salt mixed with some seasoning. You find it in the baking aisle with all the other spices and salts. You can just use salt, but I would use less of regular salt. Oh, this sounds delish, Lynn, and super easy, too! Might have to try these! .-= Sherry´s last blog ..Goody Girl Potatoes =-. I grew up with sometime similar. The potatoes were cut into discs (8-10 per potato?) and a drizzle of olive oil & coated with a mixture 1/2 Italian bread crumbs 1/2 parmesan cheese. Baked for 30 minutes. Yum! Here is a link to make your own seasoned salt. I save my spice bottles when they are empty to repurpose them for rubs and seasoning mixes.